January 4, 2011 - World Fuel Services Corporation announced on Monday that its wholly-owned subsidiary, World Fuel Services, Inc., has completed the previously announced acquisition of The Hiller Group, Inc. and certain affiliates ("Hiller"), a leading U.S. general aviation fuel distribution business. 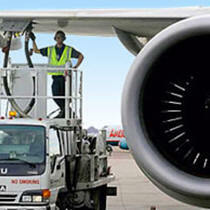 "The Hiller acquisition further strengthens our position in the general aviation fuel distribution business,? stated Michael J. Kasbar, president and chief operating officer of World Fuel Services Corporation. "We look forward to partnering with the Hiller team and are excited at the many growth opportunities that lie ahead." Hiller, based in Tampa, Florida, with annual volume of more than 120 million gallons, is a leading supplier of aviation fuel to fixed base operators and corporate flight departments. The Hiller Group was founded in 1975, and expanding into aviation in 1985, Hiller ranks among the top 150 privately held firms in Florida. The company, based in Tampa, Florida, is a leading supplier of aviation fuels to fixed base operations, corporate flight departments, airlines, freight/cargo operations, military and helicopter operations, with annual volume of more than 120 million gallons of fuel. They also provide a full range of support services such as marketing, tailored business solutions, freight expertise and credit card processing. The transaction is expected to be $0.05 to $0.07 accretive to earnings in the first twelve months. Headquartered in Miami, Florida, World Fuel Services is a leading global fuel logistics company, principally engaged in the marketing, sale and distribution of marine, aviation and land fuel products and related services on a worldwide basis. World Fuel Services sells fuel and delivers services to its clients at more than 6,000 locations in 200 countries, including airports, seaports, tanker truck loading terminals and other customer storage locations. With 46 strategically located global offices, World Fuel Services offers its clients a value-added outsource service for the supply, quality control, logistical support and price risk management of marine, aviation and land fuel. The Company's global team of market makers provides deep domain expertise in all aspects of marine, aviation and land fuel management. World Fuel Services' marine customers include international container and tanker fleets, cruise lines and time-charter operators, as well as the United States and foreign governments. Aviation customers include commercial airlines, cargo carriers and private aircraft, as well as the United States and foreign governments. Land customers include petroleum distributors, retail petroleum operators, and industrial, commercial and government accounts.